suddenly became dizzy and pale because he hadn’t eaten in many hours, and there was no food left on the plane. Without thinking about it, Jane gave him the candy bar that she had in her purse. A short time later the color had returned to his cheeks, the boy was laughing again with his friends, and Jane realized that this one small act of kindness—helping another person who was suffering—had provided her with comfort and a sense of well-being. It was shortly thereafter that this fifty-two-year-old writer decided to become an emergency medical technician, eventually coming to be known as Ambulance Girl. Stern tells her story with great humor and poignancy, creating a wonderful portrait of a middle-aged, Woody Allen–ish woman who was “deeply and neurotically terrified of sick and dead people,” but who went out into the world to save other people’s lives as a way of saving her own. Her story begins with the boot camp of EMT training: 140 hours at the hands of a dour ex-marine who took delight in presenting a veritable parade of amputations, hideous deformities, and gross disasters. Jane—overweight and badly out of shape—had to surmount physical challenges like carrying a 250-pound man seated in a chair down a dark flight of stairs. After class she did rounds in the emergency room of a local hospital, where she attended to a schizophrenic kickboxer who had tried to kill his mother that morning and a stockbroker who was taken off the commuter train to Manhattan with delirium tremens so bad it killed him. Each call Stern describes is a vignette of human nature, often with a life in the balance. From an AIDS hospice to town drunks, yuppie wife beaters to psychopaths, Jane comes to see the true nature and underlying mysteries of a town she had called home for twenty years. Throughout the book we follow her as she gets her sea legs and finally bonds with the burly, handsome firefighters who become her colleagues. At the end, she is named the first woman officer of the department—a triumph we joyously share with her. 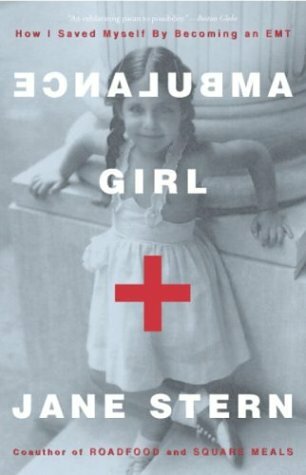 Ambulance Girl is an inspiring story by a woman who found, somewhat late in life, that “in helping others I learned to help myself.” It is a book to be treasured and shared. From the Hardcover edition.